Bron-Y-Garth is a uniquely beautiful 6 bedroom country house situated just 2 miles from Bideford in North Devon which can comfortably accommodate up to 22 people. 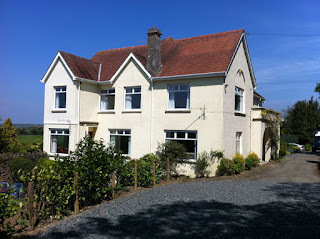 It is set in 1.5 acres of grounds with unparalleled views over fields and valleys to the coast and Bideford Bay. Internally the house is extremely attractive, very spacious and well equipped with facilities more than sufficient for larger groups. Externally the grounds are superb with extensive lawns, play area complete with goalposts, flower borders and a large walled patio area which is ideal for barbecues and sunbathing. Around forty per cent of our business comes from repeat bookings and by recommendation. Some families have been coming for 10 years or more. 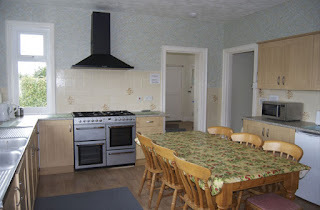 The bedrooms are set up and equipped as family rooms and with the recently added sixth bedroom, 22 people can be comfortably accommodated. Recently a large car parking area has been added to create extra parking for wedding groups etc.